Thankfully for what will one day be the most horrifying Hitchcock remake ever, robot birds are nothing new. But now, in order to monitor the effects of climate change, scientists have figured out how to trick real, live penguins into accepting the robotic imposters. And all they had to do was make the fuzziest, most adorable Big Brother you ever did see. The first version, made of fibreglass, scared the birds. The disguise went through about five iterations before the researchers designed a version that didn't scare the penguins — one covered in soft fuzz like a real baby penguin. In fact, the penguins were so comfortable with the disguise that the chicks huddled against it as they do each other, and the adults sang to it, appearing disappointed when it didn't answer back. Which is simultaneously adorable and heartbreaking and infuriating (don't trust the robot, you dumb birds, this is how The Penguin Fall begins). 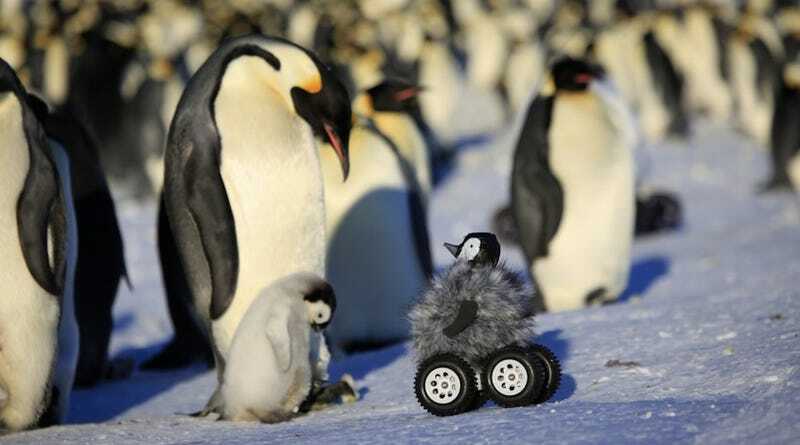 On the other hands, this revelation that penguins are so accepting of mechanical spies will be immensely helpful in studying the affects of climate change on the Arctic birds. From here, researchers will be working on developing a more life-like, adult Emperor penguin robot in terms of both movement and sound.